I never knew how much could be learned in four months. Wow, seriously? Four months?! This is sincere disbelief. I hadn’t realized that this semester was only 4 months long until just now. 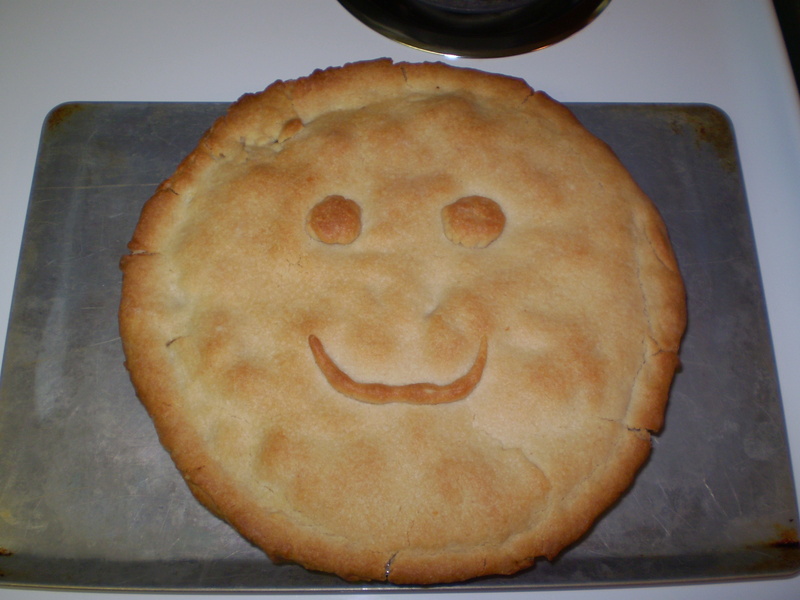 My homemade pot pie, foreshadowing how happy all my food will be. Okay, so I really never knew how much could be learned in four months, and I am someone who actively seeks out learning. Anyway, I learned more about the environment, our food, and our water in this semester than I have, well, ever. And I found it all fascinating. Mostly we learned about food and what it will take to make our food better. I paid attention to what I ate before, but now I understand my food beyond my fridge. I understand what it means to be organic and why it’s important. I read labels, I seek out locally grown food, and I am more likely to go to a restaurant that serves humanely raised-livestock. More importantly, I realize that paying attention to these things will make a difference. Working with this class was a semester-long service learning project for the Douglas County Food Policy Council. DCFPC is working towards a local food economy for Douglas County, and by working for them, I have slowly been able to see the start of something profound. We started with a class who informed a council who will change the community. I love Lawrence and I’ve always believed it to be part of cutting-edge issues. The Food Policy Council is no exception. Lawrence is a culturally and ideologically fertile place to instigate this project. The community is receptive and there is an endless stream of eager-minded students to facilitate in the effort. I believe that a local food system is imperative and important, and that many community’s world wide will soon follow suit. I intend to follow the Council’s progress over the next few years, and eat locally and slow for the rest of my life, realizing in all situations that food is a solution.